Deep Red was a giant step forward for Dario Argento. Although he had been directing his own films for six years, his work was too often compared to Mario Bava's movies. 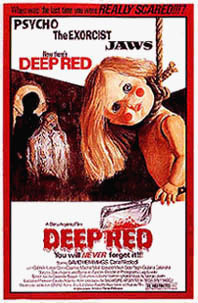 With Deep Red, he truly came into his own and created what many feel is his masterpiece. Known around the world mostly by its Italian title Profondo Rosso, Argento's best giallo contains wonderful set pieces and beautifully choreographed and imaginative death sequences. With its lurid colors and characters, as well as the traditional black-gloved killer, Deep Red is a prime example of the Italian crime thriller. As a child's lullaby plays, we see the shadows of two people in a house with a Christmas tree in the foreground. One of them is stabbing the other. The butcher knife is thrown on the floor and lands near the feet of a child. In Rome, at the European Congress On Parapsychology, a conference is taking place on telepathy. Red curtains part to reveal a three person panel in the crowded auditorium. The moderator is Professor Giordani (Glauco Mauri), and the special guest tonight is Helga Ulmann (Macha Meril) of Lithuania. They are joined on the stage by another expert on the subject named Bardi (Piero Mazzinghi). To prove her telepathic gift, Helga picks out a random man from the audience. She tells him the number of keys he is clutching in his pocket, as well as his name. Suddenly, the psychic feels a jolt. She calls it, "Strange and sharp...like the prick of a thorn." It's a feeling of death, she says. As Professor Giordani and Bardi try to calm her down, Helga claims that someone in the room is sending her murderous thoughts. She says that the person "killed and will kill again." She senses a house and blood - and hears a child singing. The person she's talking about quickly exits the auditorium but we don't see who it is. The stranger goes into the bathroom feeling queasy. A guy in the restroom offers assistance but the the person doesn't accept...and instead puts on a pair of black leather gloves. The gloved one waits in the bathroom until the conference is over - and listens to Helga tell the professor that she is going home to write down her experience that evening. Furthermore, she tells Professer Giordani that she knows who the killer is. In an overhead moving crane shot, we see various items in the killer's home: a toy crib, a Voodoo doll stuck with pins, a gruesome drawing of a victim bleeding from a stab wound, a jeweled paperweight, a babydoll, a figure of a demon, and finally...a couple of knives. We also observe the eye of this stranger, as eyeliner is applied. Helga is in her apartment, speaking to someone on the telephone. Out of the blue, she hears a child's lullaby playing nearby. Her doorbell rings and she ends the conversation. As she approaches the door, she gets a dreadful premonition and steps back in horror. Somebody pushes the door open and strikes her with a meat cleaver. Helga tries to crawl away but the figure hits her again in the back and head. Marcus Daly (David Hemmings) is returning home at that precise moment. He recognizes a friend of his in the street and stops to talk to him. Carlo (Gabriele Lavia) has just left a bar and is drunk. The two men hear the screams coming from Helga's apartment. Carlo doesn't hang around but Marc looks up and happens to see Helga at her window. He sees someone come up from behind and smash her head...knocking her through the glass. He rushes into the building, where he is a tenant who lives above her. However, it's too late. Helga's neck was severed on the broken window glass. Looking down at the street, Marc catches a glimpse of the killer running from the scene, wearing a brown raincoat. The police arrive and while talking to one of the officers, Marc wonders if they have removed a piece of evidence. There are paintings everywhere of ghastly, distorted faces. He has a vague recollection of seeing something that might have been a clue to the killer's identity. Gianna Brezzi (Daria Nicolodi), a local reporter, shows up to document the case. She guesses that Marc was the eyewitness to the crime - and leaves after taking his photograph. Marc goes back into the street and finds his friend Carlo still wandering around. Carlo saw the killer exiting the building but didn't get a good look. Marc tells his still intoxicated friend that he believes he saw a painting when he first entered Helga's apartment...which then disappeared. Both Marc and Gianna attend Helga's burial. It's a Jewish ceremony and they watch as she's put to rest. Professor Giordani and Bardi are among the mourners. As they leave the cemetery, Marc sarcastically thanks Gianna for plastering his face across the cover of her newspaper. Giordani and Bardi take Marc and Gianna back to the auditorium where they shared the panel with Helga. Giordani recreates Helga's telepathic incident and Bardi recalls seeing someone get up and exit the conference. Alone together, Gianna questions Marc about his choice of career. He's a piano teacher who teaches Jazz. They spar verbally and Gianna challenges him to an arm wrestling match. Of course, she wins. Hoping to figure out who murdered Helga, Marc goes to see Carlo. When he arrives at the young man's apartment, his mother answers the door. Marta (Clara Calamai) is an eccentric older woman with jet black hair and far too much make-up. She tells Marc that Carlo isn't home and tries to get him to stay. But Marc is insistent on speaking with her son. Marta gives him the name and address of the person Carlo is staying with. Marc is surprised to find an effete man living there. Although he hadn't known that his friend was gay, he is nonplussed. Carlo is in the bedroom, once again inebriated. He and Marc go for a walk together. Marc is still convinced about the existence of the missing painting and Carlo tries to talk him out of pursuing his investigation. That evening, Marc is practicing at home. As he is plays the piano, someone enters his apartment. He thinks he hears something but tries to ignore it. He then hears a child's lullaby coming from somewhere inside. Sensing an intruder, Marc leaps up and pulls the living room door shut. Just then, Gianna calls and Marc tells her that someone is trying to kill him. From the other side of the door, he gets an ominous threat. The voice tells him, "This time you're safe but I'll kill you anyway...sooner or later!" Marc rushes to his window - only to see the stranger in the brown raincoat quickly walking away. The following day, Marc goes out and buys a recording of the lullaby he heard in his pad. He plays it for Professor Giordani and Bardi - and together, they try and figure out its significance. Giordani guesses it must be something the killer needs to hear in order to trigger his murderous impulse. Bardi recommends a book on folklore called Modern Ghosts and Black Legends of Today. It includes a story told of a house from which neighbors would hear a child's singing. Apparently, an act of bloodshed had been committed in that home. Marc goes to the library and reads the passage Bardi was talking about. The book was written by a woman named Amanda Righetti. Marc calls Gianna and has her find out the author's place of residence. Amanda (Giuliana Calandra) lives in an isolated area outside of Rome. After bidding her maid goodbye by the road, she goes back into the house. She sees a naked baby doll hanging with a noose around its neck. Someone turns the lights out. Terrified, Amanda crouches down on the floor...holding a knitting needle. Thinking she is being attacked, she strikes but ends up killing her pet bird instead. Amanda gets up - and is promptly hit in the head by the intruder. She manages to make it to the bathroom but the psycho knocks her head against the wall...and fills the tub with hot water. Before Amanda can react, the killer dunks her head in the scorching H2O. Lying on the floor, her face covered with welts, she is able to write something on the wall because of the steam. When Marc arrives, he finds her body - but doesn't inform the authorities. The maid returns the next day and reports the murder to the police. Marc tells Giordani that Amanda's corpse was pointing at something. The professor decides to go to the murder scene. While Amanda's domestic is cleaning off the blood in the bathroom, Giordani notices that the steam from the hot water reveals a name scrawled on the wall. Amanda attempted to reveal the killer's identity before she died. Using a photo in Amanda's book, Marc finds the house she wrote about. The most recent owner died under mysterious circumstances and it is now abandoned. The realtor gives Marc the keys...and although he and his daughter warn Marc about ghosts, Marc sets out to search for clues. While wandering around the vast home, he notices something on a wall that has been covered with plaster. Marc chips away at it. Underneath is a child's painting of what looks like an adult being stabbed by a kid. There is a Christmas tree drawn as well. Professor Giordani tries to reach Marc...but Marc is on his way home and doesn't get the call. Now the killer is in the professor's apartment. Giordani realizes this and picks up a knife. A laughing, mechanical doll comes towards him. He strikes the doll and it falls to the ground with its arms flailing. The gloved killer comes up from behind and shoves Giordani's head against the fireplace - and then a table, breaking his teeth. The knife is picked up and plunged into the professor's neck. Marc tries to phone Carlo but his mother answers. She tells him that her son isn't home. While talking to her, Marc is looking at the photo of the abandoned house. He realizes that he missed something. There is a window in the picture - which he didn't see when he was there. He leaves a note for Gianna, then heads back to take another look. Sure enough, the window is part of a room that has been sealed off. Marc climbs up the side of the house and uses a pick to chip at the wall. He nearly falls and decides instead to get to the room from the inside. Marc finds something shocking. It is the skeletal remains of a corpse. As he approaches it, someone strikes him in the back of his head. When he wakes up, Gianna is standing over him. She had received the note he left her and had set out to assist him. She tells Marc that when she got there, she found him unconscious and the home was set on fire. She managed to pull him to safety just in time. At the realtor's home, they report the arson to the authorities. Marc notices a drawing hanging in the bedroom of the realtor's daughter. The sketch is almost identical to the one he saw in the house: a child holding a bloody knife. The little girl tells him she found it when she was cleaning out the archives in her school. Marc and Gianna decide to go the Leonardo da Vinci school. It's late at night and there's nobody there. They go to the archive room and search through all of the student drawings that have been saved over the years. Gianna leaves to call the police and let them know that they are there. Finally, Marc finds a drawing similar to the other two he has seen. He hurries out to tell Gianna but finds her with a knife protruding from her stomach. He tells her that he now knows who the killer is. The name was written on the drawing. As the police arrive, Marc is confronted by Carlo. He points a gun at Marc and tells him that he should have stayed out of it. He is about to pull the trigger when one of the officers shoots at him. Carlo runs out of the building and into the street. A truck is passing by...and somehow, Carlo's leg gets entangled in something hanging out of the vehicle. He is dragged a long distance while the two people in the truck are oblivious. Finally, it comes to a stop and an oncoming car runs over him. It's a grisly death. At the hospital, Marc is relieved to discover that Gianna has survived the attack. Walking home, he suddenly has a realization. Carlo was with him when Helga was killed - so he couldn't have been the murderer! He rushes into his building and into Helga's apartment - which has been sealed off. Looking at the paintings on the wall, he finally solves the puzzle that has eluded him. There is a mirror...and what he saw in it was the killer's face. As he walked quickly and nervously through the crime scene that night, he assumed that the face in the mirror was just another painting. The killer is there in the apartment. It turns out to be Marta, Carlo's mother. She tells Marc that Carlo had nothing to do with the killings and was just trying to protect her. In a flashback, we see what happened all those years ago. Carlo's father was going to put the boy's mother in a mental institution. It was during the holidays and Carlo was playing a record of a child's lullaby. While his father had his back turned, Marta stabbed him with a huge carving knife. Carlo's father fell near the boy but was able to take the knife out of his back. The little boy picked up the murder weapon - and that is the image he drew over and over again. Marta lunges at Marc with a meat cleaver. She misses and Marc is able to run into the hallway. She comes at him but he trips her. The older woman falls and her necklace gets stuck in the elevator shaft. Thinking quickly, Marc presses the elevator button and the lift begins to move. The necklace strangles Marta...and she is decapitated. Marc is left sitting on the floor, looking at his reflection in the huge puddle of blood before him. Deep Red AKA Profondo Rosso is a near perfect giallo by Dario Argento that should be the standard by which all other Italian thrillers are measured. The acting is good, the plot moves along quickly...and it's all emphasized by one of the most original scores up to that point. For the first time, Argento used music by the group Goblin to set the pace. While most horror films contain music that is subtle, moody and atmospheric...Goblin's score was loud, pounding - and in your face. In this case, it complimented the visuals nicely. The complicated screenplay was written by both Argento and Bernardino Zapponi, who had scripted some of Fellini's movies. Argento has said he was never happier than when he made this film. The enthusiasm is evident throughout the finished product. Adding to his overall state-of-mind is that he met and fell in love with Daria Nicolodi during the shoot. Their relationship would last a couple of years...and during that time, she would script Suspiria and star in several important Argento projects. They produced a daughter they named Asia, who would prove to be a star in her own right. Fans often dispute whether Deep Red or Suspiria is Argento's greatest work. They certainly stand as his twin crowning achievements. This period in his career is what gave him a lasting reputation as one of the top directors in the genre.